Overdue update. 2 new volunteers this month- welcome both. Gangway now complete with bellows both footplates have been trial fitted and are now just off for painting. There are a few brass fittings to support the canvas curtain to put on, and the two stowage hooks for securing the gangway when running at the end of a set to fit, but otherwise this end is complete. The whole exterior has been rubbed down again prior to first coat of gloss. All commode handles have been sealed on and the bolts trimmed, filed and painted. The missing destination board brackets have been screwed onto the west side, and that means all the exterior bits are on, save for the window bolections. 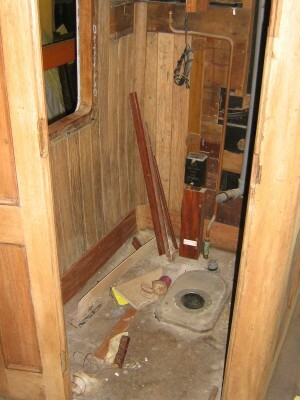 Inside, both toilet interiors have been dismantled, and the timber sections removed, cleaned and sanded, and replaced ready for varnish. Work on the saloon interior panels continues off site, with most bits now ready to refit once we have stopped throwing paint around overhead. 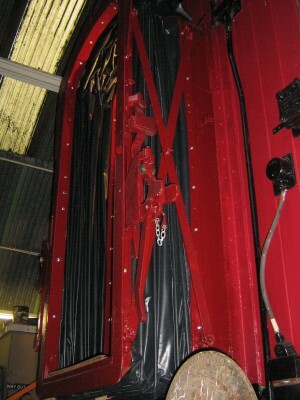 With a view to this, the ceiling has had another coat of gloss to blend in the recently fitted passenger communication cord tubing. One more coat of enamel to go, and the chain can be threaded in, and we have some Alarm Signal transfers courtesy of the NRM. 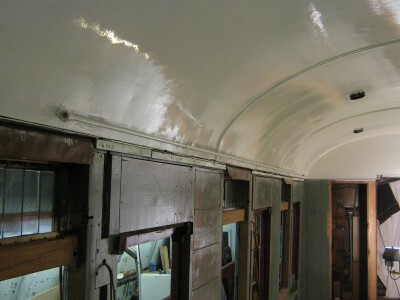 Most of the interior is now cleared ready to strip out the old cracked and lumpy floor covering, but this won’t be fitted until after we are happy with the ceiling paintjob. 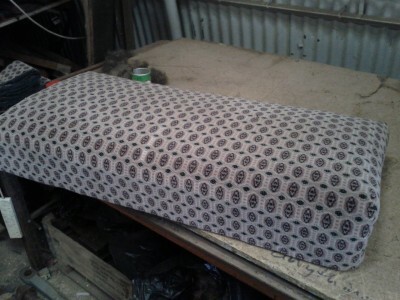 Seat trimming is accelerating, we need to purchase some of the less obvious materials for this job now- vinyl for the undersides of the armrests, fabric for piping, covered buttons, tacks, pins, plywood for quarter panels. Some good news on the light fitting project as well, but as progress on supply of fittings is usually accompanied by an invoice, we’re having to pace ourselves to keep things moving without running out of cash. Some movement on further small castings as well, table leg bases and clips are now in stock, and attention has turned to light switches.